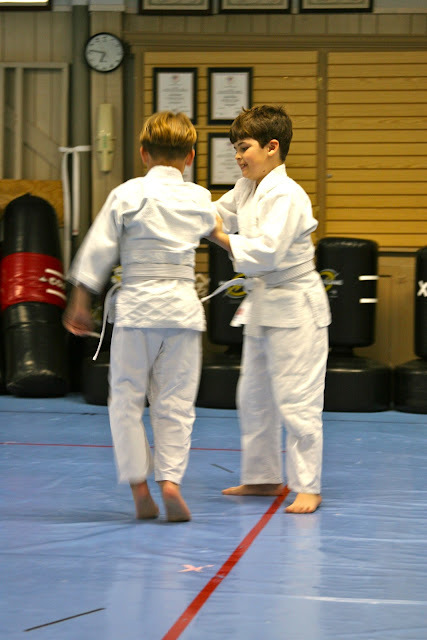 Nick and Nathaniel started karate (actually, aiki-judo, to be specific) the last week of March at a karate school less than a mile from their school. They'd decided to take a break -- maybe permanently -- from baseball, and this was the next thing they wanted to try. I took them to a "sample" class before we committed to participation, and before the class was even over, they were looking over at me, grinning like fools and nodding that this was definitely something they wanted to do. So before we left the dojo that night, I paid the deposit and first month's class fees, and we got them outfitted in uniforms with white belts. 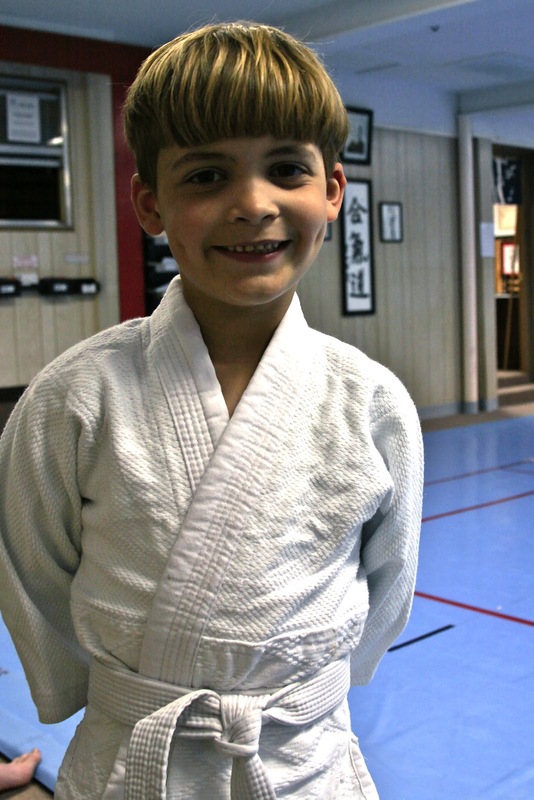 Since then, every Monday and Wednesday night from 6:20 to 7:30, we've been at the dojo. 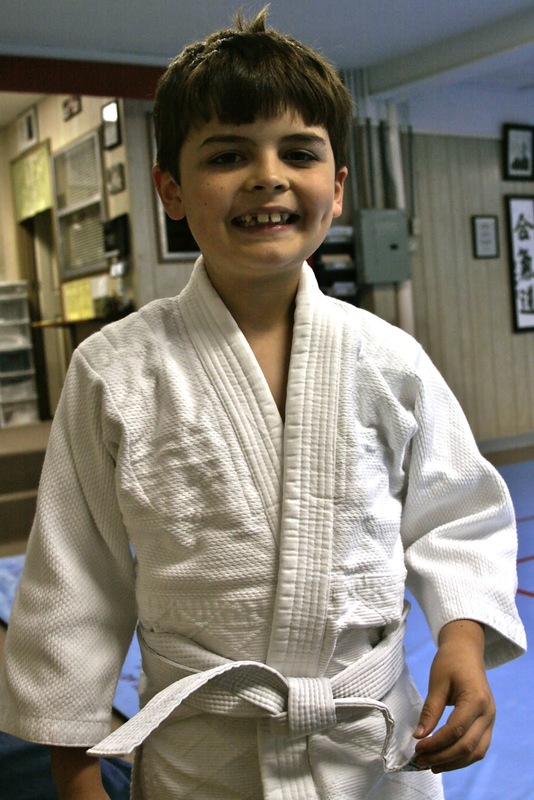 Their class is a mixed-level class, so they have white, yellow, green and blue belts there. It's really a super set-up, because the more experienced kids get partnered with the less-experienced kids sometimes, and they really learn a lot from them. As students are arriving and checking in, the kids who've already signed their attendance cards and turned in their weekly behavior sheets (Yes! They fill them out completely and the parents sign them. It's been a great motivational tool in our home!) 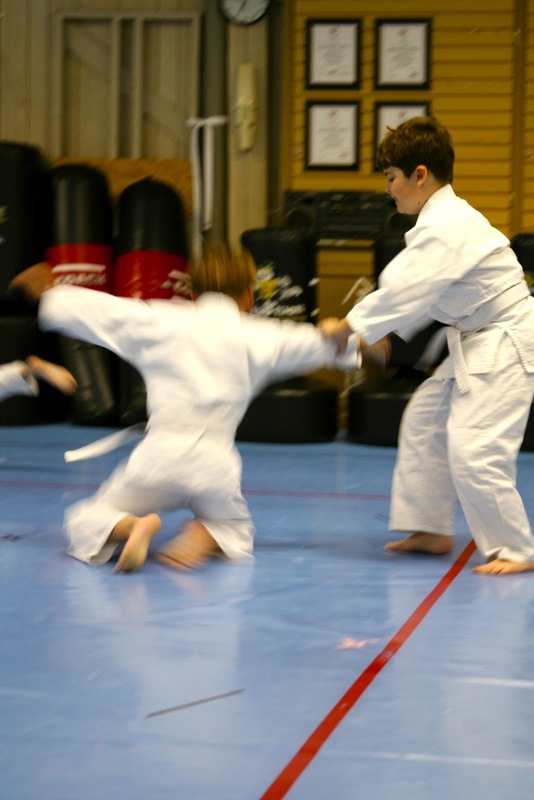 can practice controlled tumbling on the mat. 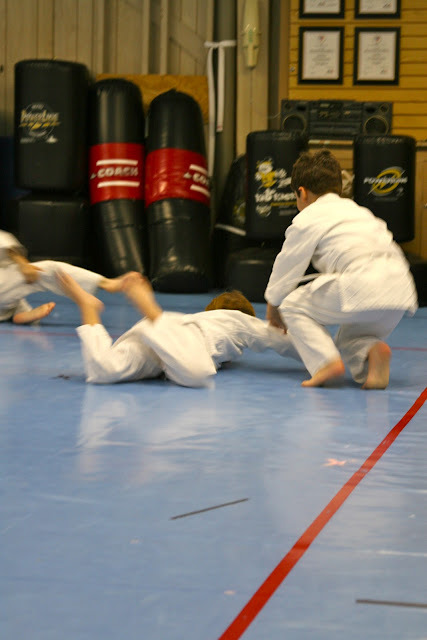 It amuses me to see how much my boys enjoy simply rolling around on a mat. 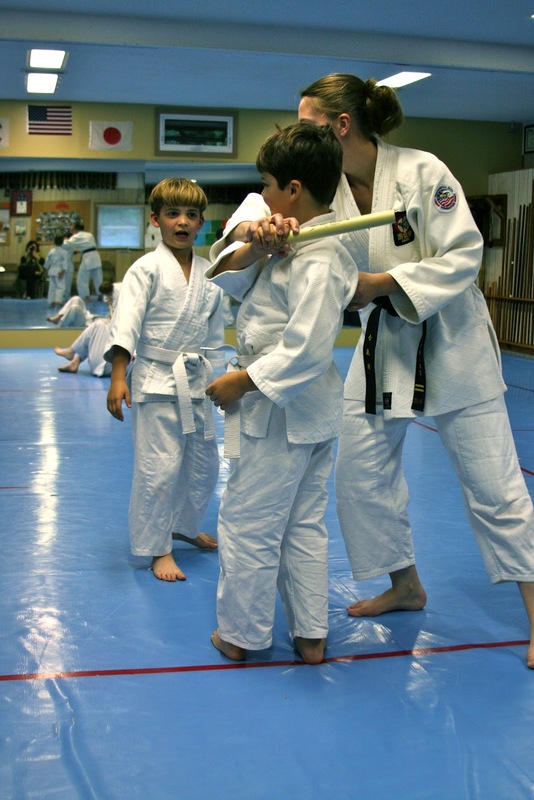 Once everyone is signed in, class begins with a formal greeting of teacher to students, and vice versa. Then the training begins. 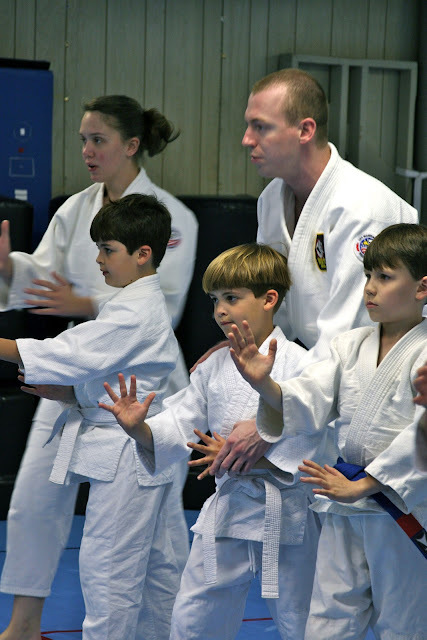 They learn individual moves as a class (and they learn them all by their traditional Japanese name, and have to memorize a lot of Japanese vocabulary to be able to follow along), but once they break out into teams to practice, they get individual instruction from one of three senseis. I like watching the boys spar in a controlled environment using correct technique. 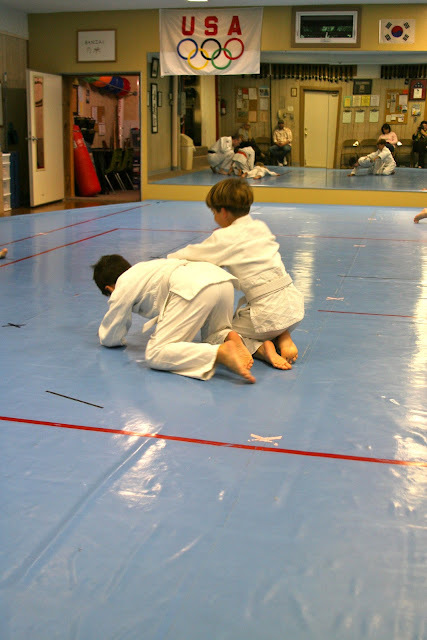 As opposed to watching them wrestle on my den floor using schoolyard technique. They've learned so much in such a short time! They concentrate a lot on form in their classes. I've been a little surprised at how patient the boys are during this part of class. 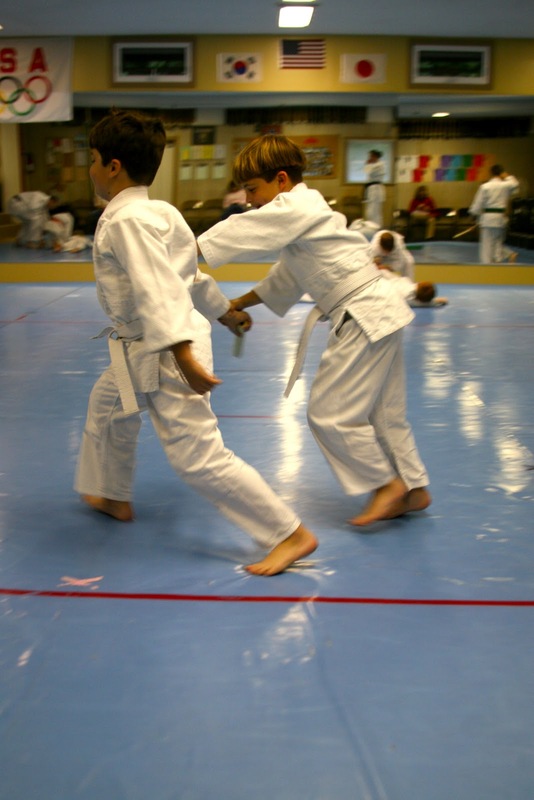 But I know they understand how important it is to learn the correct form, and that they won't be able to move up in rank if they don't do everything properly. So Jake is dying to start, but he must wait. And I feel sure Amelia will want to do it, too, especially if all three of the boys are doing it. She LOVES watching. She's captivated by it. I've taken my Kindle a couple of times, but I find myself watching class instead of reading, so I've quit taking any extra entertainment with me. Class is interesting enough! Nick and Nathaniel are so close in size that they make good opponents for one another. Blurry wide shots, however, I don't have as much of an issue with. At the end of class, they do a fun physical activity. 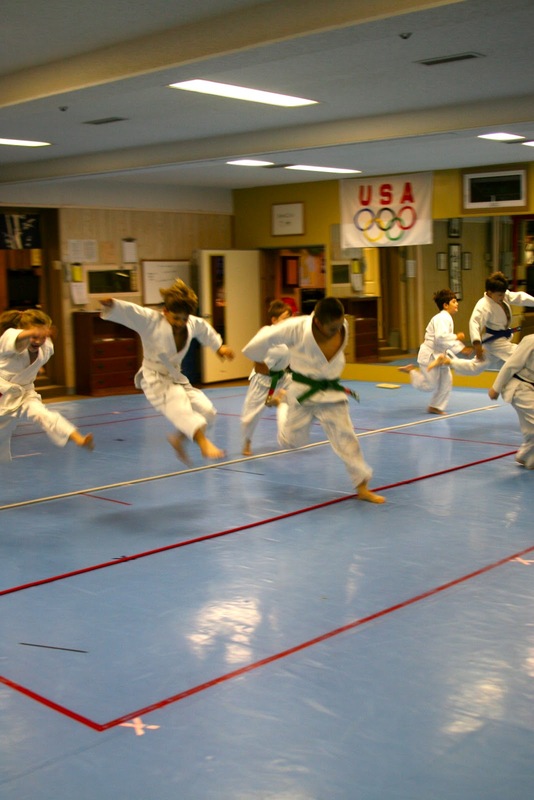 On the night I took photos, Sensei M put two ropes close to each other on the floor and had the kids jump over them. Each time the kids cleared them, he moved them a couple of inches farther apart. 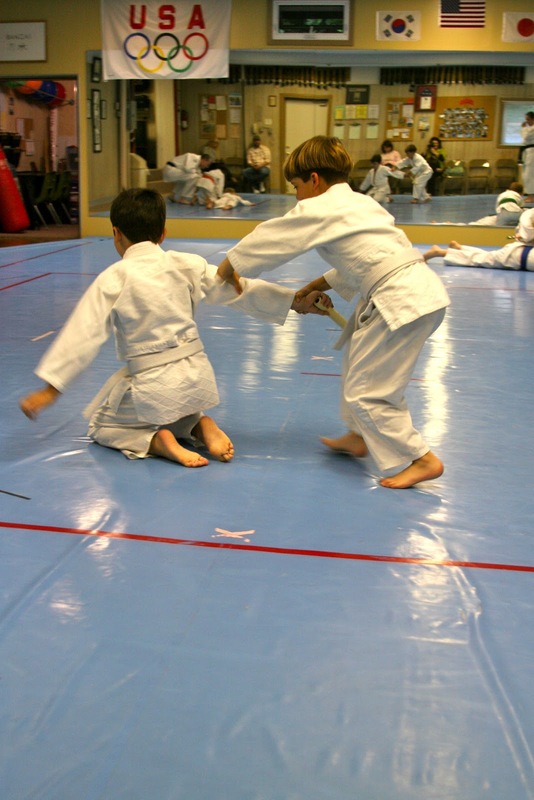 When a child landed between the ropes, he or she went to sit on the sidelines and cheer for the remaining jumpers. I was really surprised at how far the kids could jump! This was the last one Nathaniel made, but it was impressive. We are exceedingly happy with the way just one month of karate has helped shape the boys' attitudes and behavior. They have been more respectful and helpful at home, as their weekly "scores" on their sheets determine whether or not they get to participate in the next testing event. Tonight they have their first test: yellow belt. 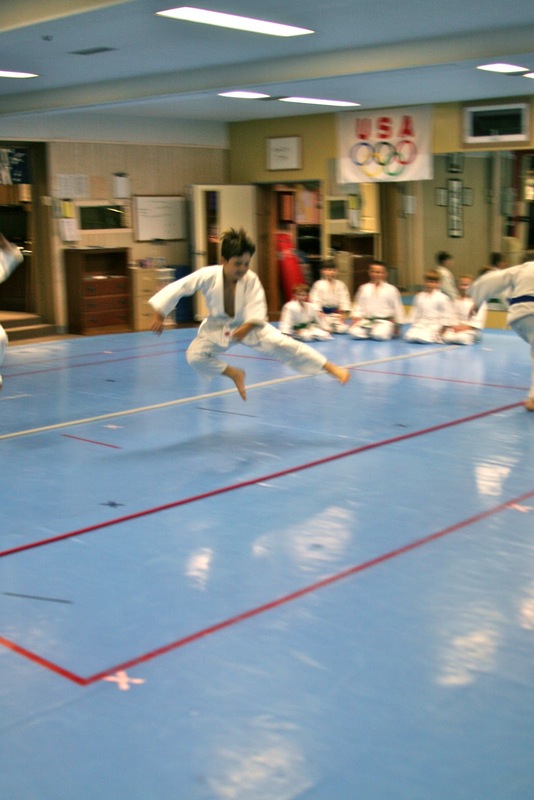 They have to demonstrate that they've memorized the student creed, know their basic terminology and can execute six or seven techniques without assistance. I'm excited for them! That is awesome! 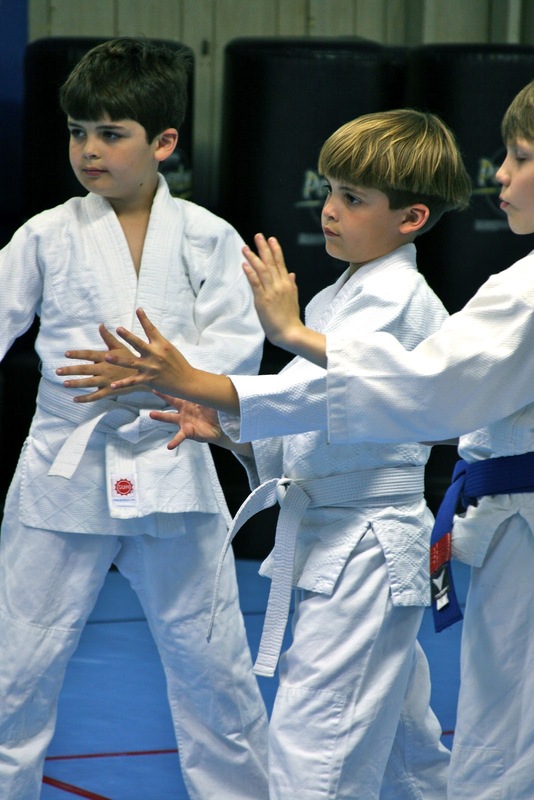 What a great way for them to learn patience and harness all that energy! My son (Pierce) takes Tae Kwon Do. This was all his dad's idea and doing, but now over a year in, I really think it's great. I love those action shots! Wow! I love your age rule. We've already started Christopher though. He won't be five until Aug. He was desperate to start Irish dancing with the other kids. He started in Jan and loves it. How fun!!! You are guys are fun parents. The age rule is a good idea. Our age rule is 4. I love having an age rule...it makes a difference! We have one for birthday parties too! No big friend parties until 5. Family parties before that. Personally, I love that one. 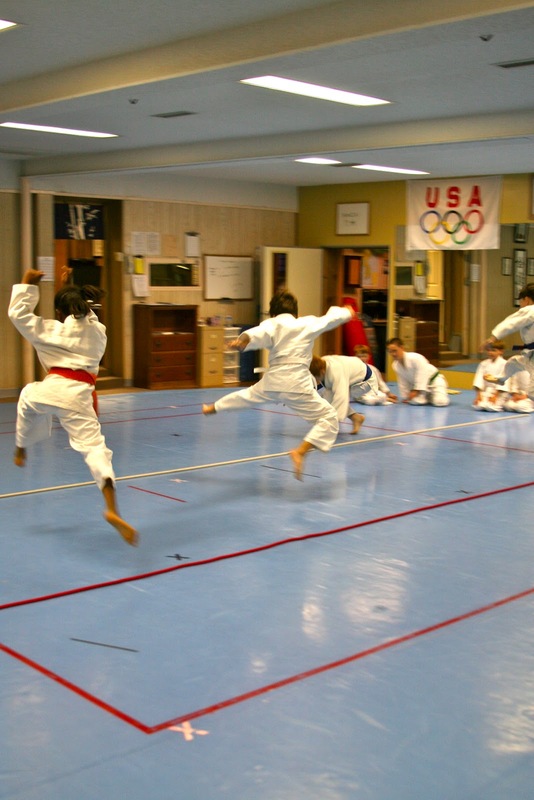 I love the karate classes. 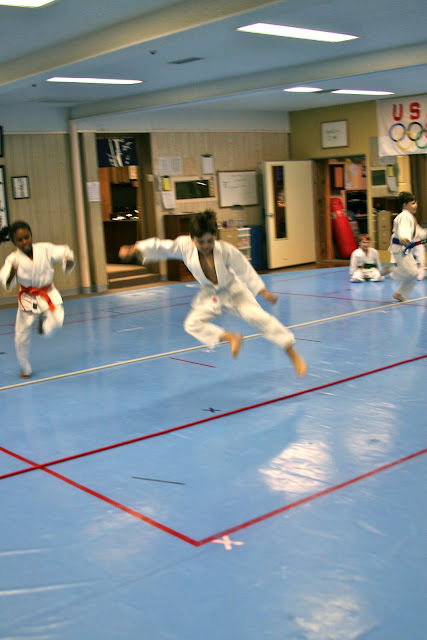 We used to do Tae Kwon Do, but I will say it is definitely a commitment and quite costly as the testing gets closer and closer together and they are involved in it more and more. Now my boys want in on it and I kind of dread it. Seeing your boys makes me think that I need to try and give it another whirl for them.